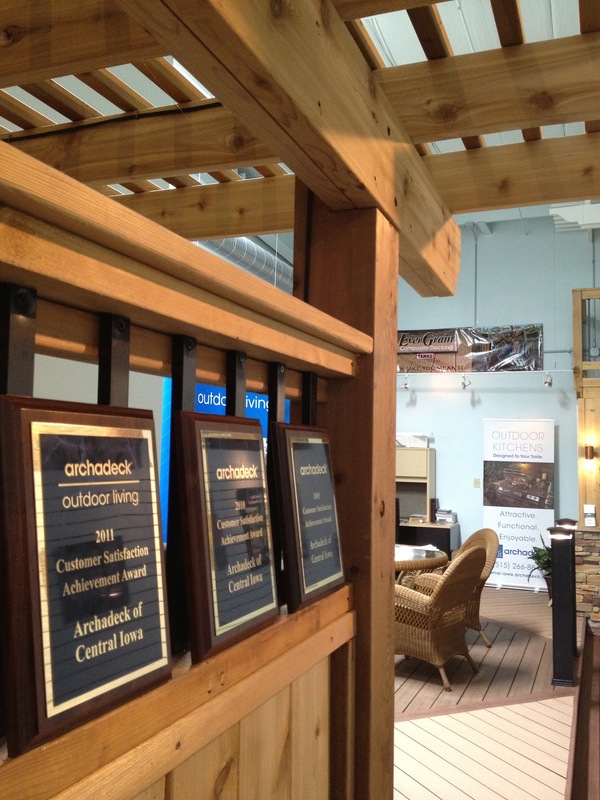 We’re just back from our annual workshop where, among other presentations, our franchisor recognizes several achievements across the Archadeck network of outdoor living space builders and designers. Customer Satisfaction Awards are some of the most coveted awards and we’re proud to announce Central Iowa’s third consecutive Customer Satisfaction Award. Satisfied customers are satisfied customers regardless of project size, complexity or style. Based on our awards and their consistency, unlike the Rolling Stones, we do get satisfaction…nearly everyday. Beyond that award, we had two other nice, unexpected acknowledgements awaiting us when we got home. 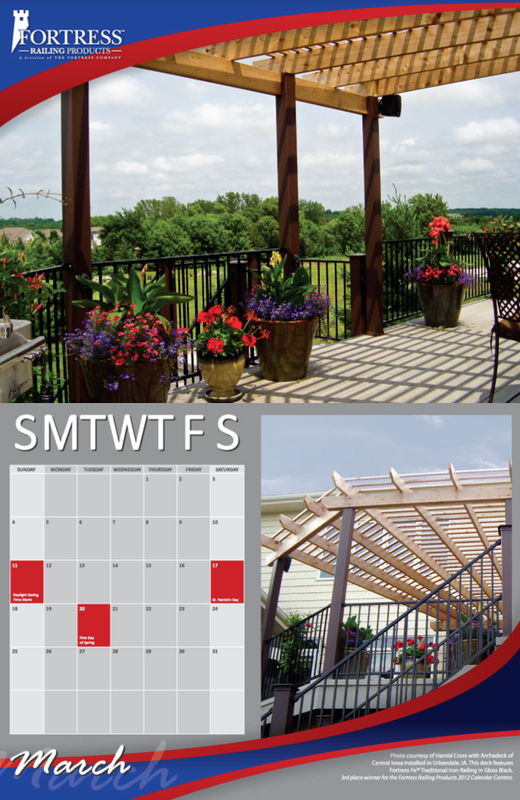 First, a project of ours was selected by Fortress Railing Products as their 3rd Place winner nationally for their 2012 Calendar Contest. As such, it is the March cover and feature on their 2012 national calendar. Obviously, Fortress is a railing (and fence) company so the focus is on our use of their FE26 Traditional Iron Railing in the project we did for our client in Urbandale, a northwest Des Moines suburb. The overall project scope included installation of a low-maintenance railing and cedar pergola on their existing builder-provided composite deck (but with wood railing, initially). The sleek, crisp look of Fortress Railing was a key component of the stunning transformation we made to our client’s deck space. The flared pergola concept was key, too. Thanks to Fortress for selecting our project for March, 2012! 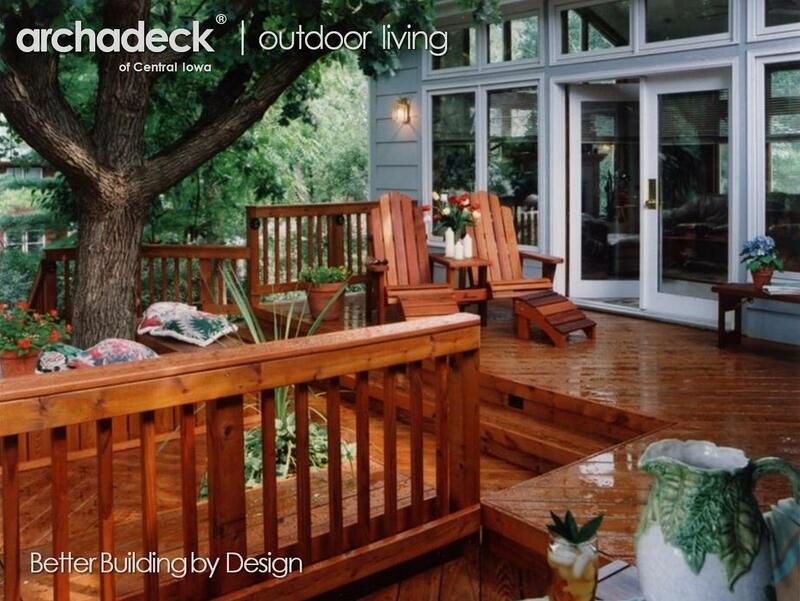 And, thanks to our clients for having the foresight to select Fortress Railing…and Archadeck…for their project! On a side note, my co-hort Rick Conrad of our Archadeck of Bucks/Mont office in Pennsylvania won the 2012 Grand Prize – the calendar cover and January features in the same Fortress calendar. Congratulations, Rick! Rick’s Grand Prize follows on the heels of our Archadeck of West Rhode Island office winning the same award in 2009. I’m in good company! Secondly, a client of ours from 1997 – yes, 1997…from the tenure of the prior Archadeck of Des Moines office – called with a question related to their initial deck design and layout. No problems or issues, she emphasized; in fact, said their deck is still the best investment they’ve made on their home. They are reviewing options for addressing a new gas meter requirement in relation to the deck’s layout and wondered if I had any information relevant to that. Unfortunately, due to the age of their project and retention limitations, I wasn’t able to provide much besides anecdotal discussion to assist her. But, she said she was very appreciative of that and my call back and said it further validated their selection of Archadeck – 15 years later – to know that we’re still actively in business. More active than ever, in fact! We’ll be gearing up for the 2012 Des Moines Home and Garden Show at the Iowa Events Center in the coming weeks. Stay tuned for more information and we look forward to seeing you there. This entry was posted in Deck Railings, Decks and Decking, Home and Garden Shows, Outdoor Living, Pergolas, Wood-Alternative Decking, Wood-Plastic Composite Decking, Wood-Plastic Composites. Bookmark the permalink.